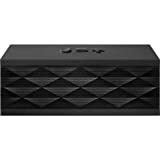 Amazon.com: Jawbone JAMBOX (Black Diamond): Cell Phones & Accessories. Jawbone's wireless speaker is a must for the music lovers in your life. The device lets you stream music from your iPhone, iPod or other Bluetooth devices with blaring sound (up to 85 decibels). Get yours today!